Hey friends. It's been a while. I haven't totally dropped off the face of the earth. Trust me, I have been working on gam, but I have also been spending a lot of time playing gam as well, which has been awesome. Finished FFVI and I've clocked up quite a few hours in the Witcher 3—such a good game. I don't have a plethora of free time, since I work full time and I train everyday (kickboxing and lifting weights), so I kinda have to split what's left between working on creative pursuits and just relaxing (i.e. playing vidya games). Anywho, you may recall an earlier blog about how my goal for 2018 was to learn Ruby ... I think I've almost accomplished that goal! I'm nowhere near as great as, like, anyone else with actual programming knowledge, but I've been doing a lot of bug-fixing and modifying existing scripts for people, which has been great for me knowledge. I've also managed to convert a bunch of event-based mechanics in my game to scripts, which is AWESOME. It makes me feel like a wizard. It also means less copy-pasta in the event editor, and things are a lot more flexible and easy to change. Plus a bunch of other little 'snippets' that just generally make life easier. One of the other nice things about my newfound Ruby-scripting-skillz is that I've been able to help other people on the RPG Maker forums, which is both heartwarming and satisfying. I think that has singlehandedly been the thing that has boosted my confidence (while also boosting my abilities). One of the frustrating things about not understanding Ruby is that you're kinda at the mercy of other people's generosity, unless you pay for someone to completely customise your game for you. There may be little tweaks to the menus and things that you want to do, but you don't even know where to start. Being able to help other people has been awesome, because I remember the frustration of not having things look exactly how I was imagining, and I know that it can be a bit of a momentum-kill as well. The more games that get released, the better, I say. For all of the character-related scenes, I really wanted to have a nice, big portrait of the character. That meant a lot of shuffling the positions of different windows and making sure everything was readable and fit well together. In the equipment scene above, I made it so that equipment categories with nothing available to equip were greyed out to make it visually obvious. If you try access them, you can't, because there's nothing to equip or remove. 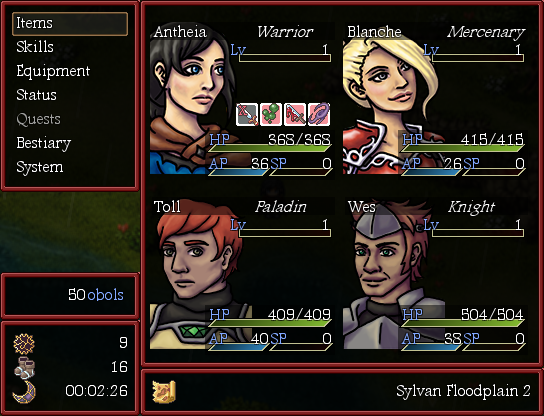 In Vermilion, your characters have access to two different types of skills—weapon and arcana (or 'magic'). Different weapons give you different weapon skills, and different 'shards' give you access to different elemental arcana skills. 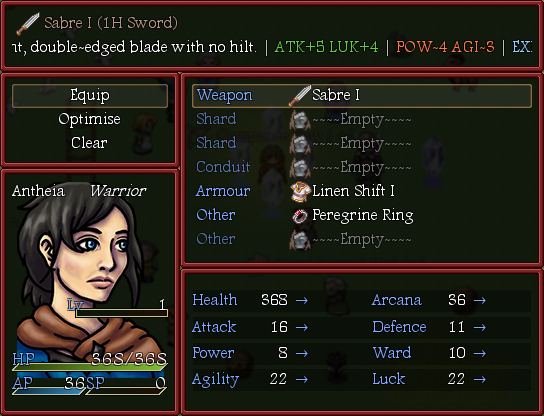 I've made it so the skill scene shows which items you currently have equipped, which is hopefully helpful for the player. However, at the moment I don't have many weapon skills for each character (5 in total, for now), so the list still looks quite bare. I'm trying to think of other things to include in the menu, hence it being 'WIP'. 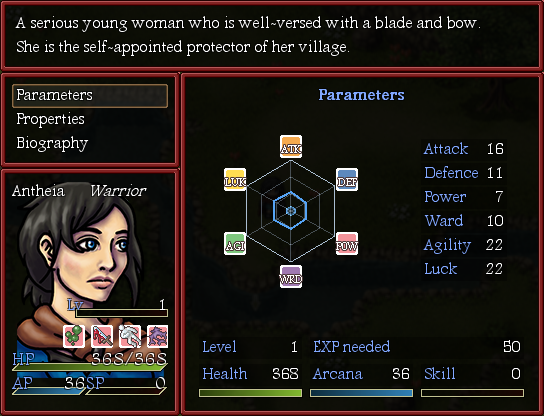 The status scene shows you the character's parameter (e.g. their attack power, magical power, defence, etc.) with a handy wee graph courtesy of a user called BlackMorning. In the Properties category, you can see things like the character's evasiveness, their critical hit rate, physical damage rate, and other fun/boring things like that. The Biography category shows a little bit of information about the character, such as their hometown, age, weight and height. Antheia here is 19, weighs 67kg and is 171cm tall. She is both lighter and taller than me. I'm also a poor judge of 'normal' weights, but I figure she's from a small farming town and she's pretty active, so yeah. I'm also trying to think of other things to fill up the Biography screen, since it's a little sparse, but I don't want to make it too gimmicky. And finally, the in-battle Equipment scene! 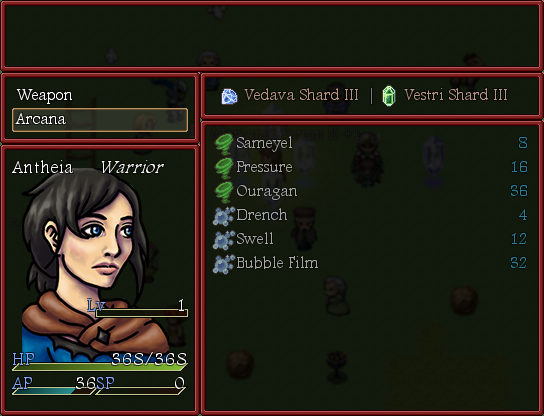 In the Vermilion demo, I had created a 'weapon change' mechanic, where you could swap your weapons around. 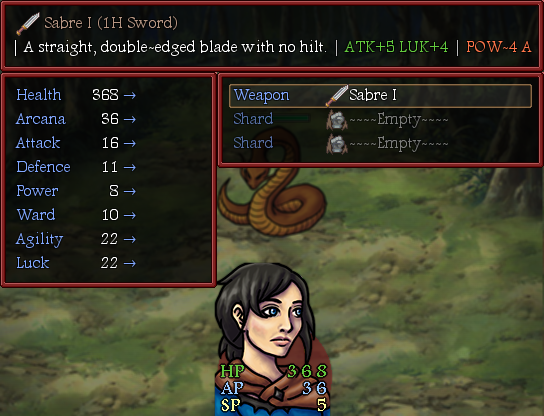 I really wanted to have a mini equipment scene instead so that the player could see the stat changes and things, but the scripts I was looking at didn't work in my game, and I didn't want every equipment slot listed. Behold the fruits of my labour. Here you can change your weapon and your shards once per turn. Creating this scene was actually way easier than I thought it would be. So that's about it for the update ... hope this was appealing. Does anyone actually read this? Am I speaking into the aether? Will I ever actually finish this game? Find out next time on DRAGONBALL Z.